A good night’s rest begins with a comfortable duvet and duvet cover. Cozy duvets are the perfect bedding solution for any hospitality provider. They are designed for ease of use and will last for many years. A first impression is a lasting one, and the bed is one of the first things a visitor notices when entering a room. White stripe duvet covers offer a clean, soft look that matches well with any decor. It is important to set the right tone from the start, and a duvet cover is a perfect choice. White duvet inserts provide all season comfort. The alternative down filling is made of 350 ounces per square yard polyester fiber-fill and is hypoallergenic. The channels are sewn from one end of the duvet to the other, and the hem is double stitched for strength. Hospitality providers appreciate the long lasting durability of the wholesale duvets and duvet covers. They can be washed many times and each time will come out looking like new. 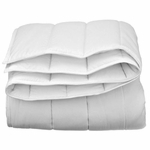 Both the duvet and covers are machine washable and dryable for quick turnarounds. The duvet has a 90 GSM microfiber shell with a soft brushed finish. The duvet cover is a 55% cotton 45% polyester blend and has a 250 thread count. Both the duvet and the duvet cover come in twin, queen, and king sizes. Attention to detail is what sets the wholesale duvets, and duvet covers apart from the crowd. The white stripe duvet covers are made to fit around the duvet. They are easy to take off and put back on after washing. Discerning patrons know quality when they see it. Hospitality providers want their customers to have a good experience during their stay. The main part of their time is spent sleeping, and the bedding needs to provide them with the most comfort possible. A cohesive look is always a great way to go when choosing to bed because it takes the guess work out of bed making. The matching covers, duvets, skirts, and pillow shams offer the perfect combination of any bed.